No, Google. I won't let you invade my priv—-wait what. What is this. Oh wow. I can finally open email links or 'mailto' URLs in Gmail? It doesn't annoyingly open up the mail app I never use? Wow. Finally! This is long overdue! Yep. 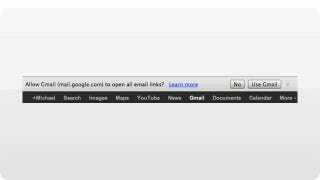 If you're using Chrome, you can make e-mail links open in Gmail now. Since I don't use a mail app, my process of e-mailing something off a website has always been to copy and paste the email address, open up Gmail and start a new e-mail. Annoying! I was jealous of other people who could just click the link and have the Compose E-mail window of their mail client automatically pop up with the send field filled in. No more! Gmail can do that too (if you use Chrome).